A few weeks ago, I was looking for new blogs to follow and asked readers for their top 3 favorites. And the response was fantastic! Almost everyone had trouble choosing 3 - I know I would too. And I sincerely thank you for helping me to discover other wonderful quilt bloggers - you all rock! With all of the responses, plus blogs that I follow, I've compiled the 'Blog List', with this being Edition 1. So that everyone has time to check out the blogs, each edition will have a list of 15 blogs. Including them all in one post would be quite overwhelming - better to break the list into smaller parts, just like making a quilt! 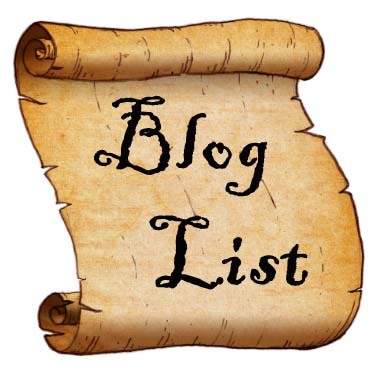 I'm still not sure how I'll incorporate the blog list into my blog, but for now, I'll write another edition once or twice a month, as time permits, as a special feature. So here we go with the first group! I tried to categorize them, making it a bit easier for everyone - let me know if a blog needs switching. And please, please, please - don't be offended if your blog isn't listed! It will in due time. Enjoy checking out the blogs - there will be more to come! You're welcome! I've got a long list and it's going to take awhile to post them all. Thanks for sharing your list! I will check them out. Happy Friday! Thank you so much for sharing these. I see a number of my favorites on your list. oooo you're the best! Thank you so much for putting me in your fave list... I love you right back! And I always love to see your smiling face and read your comments. Oh you made my day! You're welcome! Love seeing what you and Milo are up to! Another great idea you had and thank you - it takes time to do all of this! Have a great week-end. Oh by the way - love the 4 patch tutorial!!!! Thanks for doing this. As nice it would be to have a nice long list, a smaller list is more manageable. I'll have to find some time to do some exploring. Thanks for sharing. Many I follow to, but I was able to add a few. Looking forward the list 2. The Charming 4-Patch - On Overdrive! The Charming 4-Patch - Fast, Fun, and Fabulous!